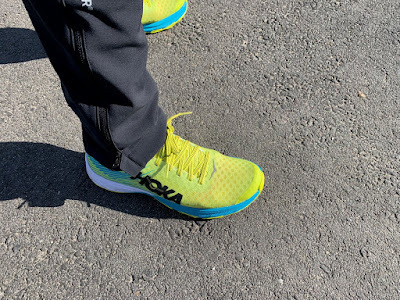 Road Trail Run: Hoka One One EVO Carbon Rocket Initial Runs Impressions Review: Explosive Power! 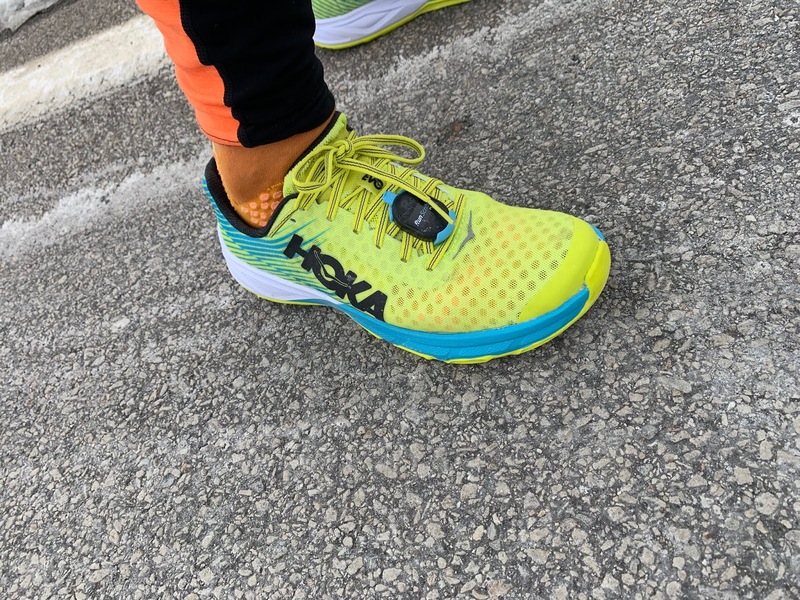 Hoka One One EVO Carbon Rocket Initial Runs Impressions Review: Explosive Power! Update: Read our full multi-tester review of the Carbon Rocket here. The Carbon Rocket is Hoka's entry in the carbon plated race shoe arms race. It weighs 7.55 oz 214 g for my US men's 8.5 so about 7.7 oz / 218 g for a US men's 9 and has a retail price of $160. It has a 26mm heel /25 mm forefoot not including the substantial 4mm Ortholite removable sock liner. It is available now. See shopping choices at the end of the article. My first run featured a few slow miles in the New Hampshire cold at about 20 F / -6 C then 4 miles at 7:58 pace, so a moderately fast tempo for me. While I have been at altitude until yesterday and done all slower running on snow, I was shocked that my average heart rate was notably low for the pace at 144 bpm. The Rocket was very comfortable at slower paces, stable and in no way harsh. My second run was 13.1 miles in a progression ending up with a 8:54 average. Conditions were at about freezing. I note the Rocket softened somewhat after a few miles. I suspect the rubberized foam outsole was what really softened. While the ride is firm, I ended up in no way beat up and finished with my fastest miles, near 8 minute pace. I appreciated the stability of the Rocket in the later miles and its consistent very strong response. The next day on a slower 5 mile run, but in no way a slow slow run I had no soreness at all which surprised me but may be shouldn't have. Firmer well cushioned midsoles can help reduce leg fatigue as the muscles are not contracting to counteract softness. At faster paces as in my first run, Rocket was truly explosive, highly responsive and very well if quite firmly cushioned (note feel likely influenced by the cold temperatures). This is not a bouncy ride (again more testing in warmer temperatures required) but a highly decisive one. Unlike the flexible and quite soft from its all rubberized foam midsole and very low stack (17mm/13mm) race flat Rehi (RTR review), there was no mistaking Rocket for a Hoka, The Carbon Rocket has plenty of cushion with a distinct rocker effect highly magnified by the carbon fiber plate. The sensation is unlike the Vaporfly where one feels a fall or drive forward to toe off from its softer Zoom X foam and carbon plate just above the outsole. Here the sensation is of barely touching the heel, no sinking or instability there and certainly no sense this is a 1mm drop shoe. Then a bit of a rise felt at mid foot and then a rapid mid foot focused propulsion effect from the plate and finally a rocker type feel to toe off. The shoe is completely stiff and thus relies it seems on a combination of the the rocker geometry of the midsole/outsole and the carbon plate. The 1mm thick carbon plate is full length and is visible through three windows: two at mid foot and one towards the heel. It is located 8mm above the yellow rubberized EVA outsole. 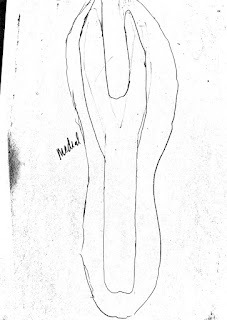 According to Hoka, the plate is in the shape of a "fork"at the forefoot which gives it a bit of flexibility under the metatarsals where the foot is flexed and needs to produce a large amount of energy. The fork is also biased so that there is less of it, a bigger opening on the forefoot lateral side, to help supination at the end of stance. 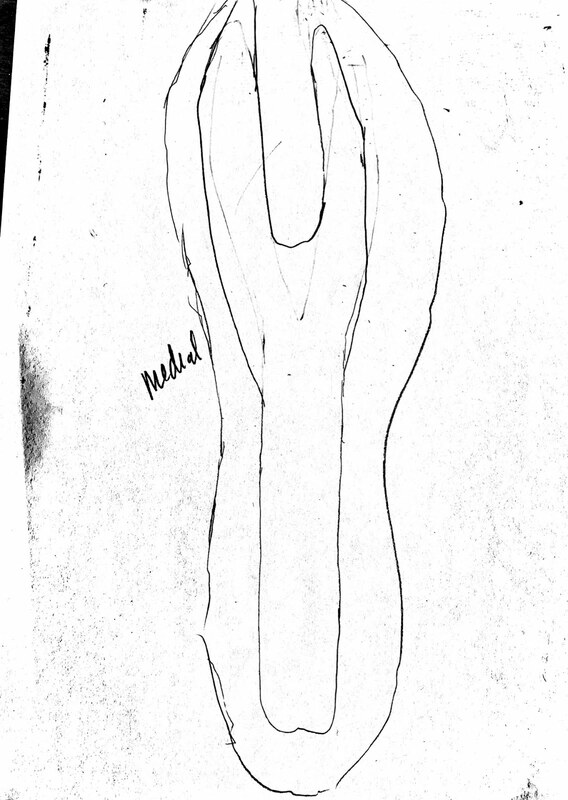 I sketched what I thought it might look like and Hoka said I was pretty close. Astute readers will recognize that unlike the VaporFly 4%'s carbon plate here the plate is not continuous at the front and is placed flat just 8mm above the RMAT outsole so it does not curve down at mid foot as Vaporfly's does. The plate's run feel and energy, when combined with the 1mm drop is more concentrated at mid foot than in the VaporFly where the curvature of the plate gives more of a sense of falling forward to toe off. 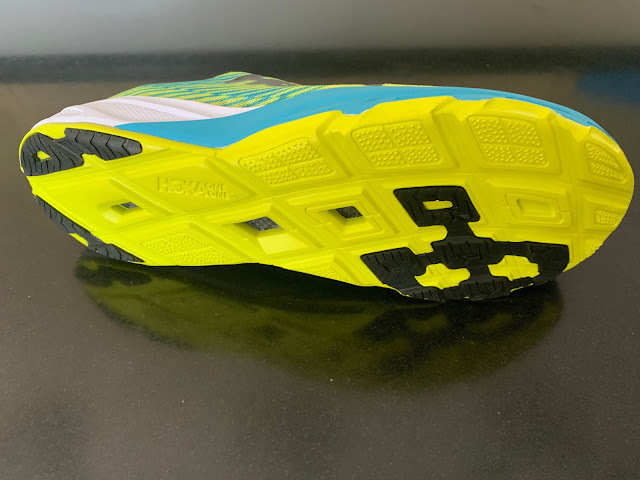 The upcoming Skechers SpeedElite (RTR first run impressions) has an H shaped plate concentrated at the front of the shoe. The ride was very well cushioned given the 26mm heel and 25 mm forefoot and on the firmer responsive side, again cold temperatures likely making the shoe firmer. For those tracking, it has as much forefoot stack as the Clifton at 25mm, and at a lighter weight, although the heel is lower in Rocket and for me far more stable. I ran the Tracer 1 and found its ride considerably harsher in comparison and without the very distinct propulsive effect of the carbon plate. I actually also prefer the ride so far to the similar weight Mach 2 (RTR review and also coming February) which while bouncy from all rubberized foam midsole outsole, while the Rocket only uses rubberized foam for the exposed outsole, just doesn't have the snap and response of the Rocket or the forefoot cushion as there is 4mm less upfront in Mach 2. EVO Carbon Rocket features a simple very ventilated engineered mesh upper with a race type fit and its a very comfortable one without any binding or pressures and an impeccable foot hold. There are no overlays beyond a smaller toe bumper.The Rocket has full heel counter. The thinly padded tongue has 1.5 inch wide thin stretch panels connecting to the midsole on either side. My first run was in medium thickness Stance socks and fit was true to size if a bit short and snug, particularly in the area of the little toe bunion so this is a quite narrow front of toe box. My second run was with "appropriate" thin Compressport Race socks and more comfortable with no bunion pressure. No question this is a race fit type upper and stuffing thick socks into them at true to size is not the way to go. 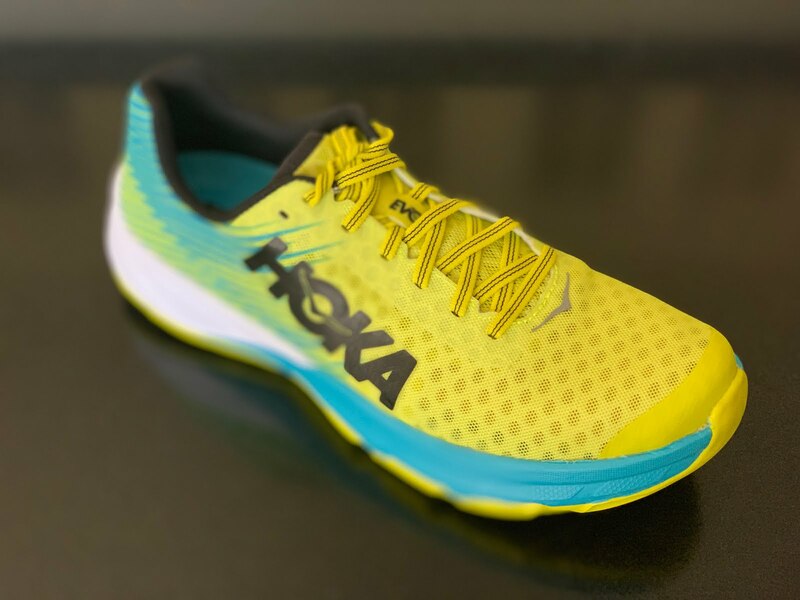 The midsole/outsole is comprised directly underfoot of Hoka ProFly dual density foam, softer at the heel for protection (white), firmer at the forefoot for propulsion (blue). It is not called out as rubberized foam. This is the first ProFly midsole that really works for me. Is it the 1mm drop balancing the softer heel feel with firmer forefoot feel better or the considerable forefoot and heel stack with no drop to speak of? Not sure but mint. Then below ProFly we have the carbon plate and on the road the yellow durable rubberized foam. with strategic rubber patches in key wear locations. This is one heck of an explosive racer and for many it should also be a faster runs trainer. The response is just tremendous here. It clearly has enough cushion, stability, and dynamic personality for many runners up to a half and faster runners for a full. And it has great manners at slower paces as well. I am amazed this is actually a 1mm drop shoe, never would have guessed and I tend to heel strike, I would not hesitate to train any tempo run in them. The carbon plate is beautifully placed in the mix of midsole and outsole so there is no harsh sense of "something there" at slower paces then when one picks up the pace the pop off at mid foot is uncanny in its power. Some may prefer a distinct flex point such as in Adios 4 or the drop forward approach with a curved carbon plate such as in Vaporfly to this more rocker oriented approach especially for longer races at slower paces. Those familiar with plates in shoes such as the Zoom Streak or GO Meb Speed should find the Rocket implementation far more elegant, effective, and less harsh. I can say that I have been superstitious about racing in anything other than Vaporfly since 2017 up to the marathon with the exception of 5K to 5 miles in the Reebok Floatride Fast Pro or when I have a next short race the Skechers Speed Elite Hyper (RTR first impressions article) but no longer with the Rocket on scene. While the Rocket may be not be enough shoe for me for a marathon (3:40 or so) for a half (1:35-1:39) they will be on my feet for my next race. Update: So I am now more than 40 miles in mostly all tempo paces in the Hoka Carbon Rocket and it continues to shine. Every run I have been able to do as had a progression of pace and easily. Earlier this week I did 10 miles n the Zoom Fly FK, a few seconds per mile overall faster overall than today's 15 miler and I was not able to pick up the pace the last miles, things got sloppy and I struggled. Today's run was 15 miles in 26 F weather finishing sub 8 for the last mile and smoothly after pretty much progressing to my marathon pace and beyond the second half. The overall stability and feel mile after mile is consistent, the plate providing rebound or pop just at the front of mid foot along with support. No leg or foot soreness during or after runs despite there being quite firm, from the plate I assume. The forefoot cushion and stability is particularly noticeable. I have found that they seem to perform best for me at near or a bit faster than 8:50 mile. Above 9 minutes they struggle a bit (as Vaporfly does for me in a different way with a soft heel feel as you need to engage the carbon lever quickly or you sink). Here the heel feels slightly lower at slower paces, but only really I think as I am aware they are 1mm, but faster than that there is no sense they are a 1mm drop shoe. They have gotten a touch more flexible, flexing way back where the dual density ProfFly midsole changes. Next some fast stuff, or fast for slow old me! I am seriously considering them for Boston over Vaporfly given the hills and their stability. 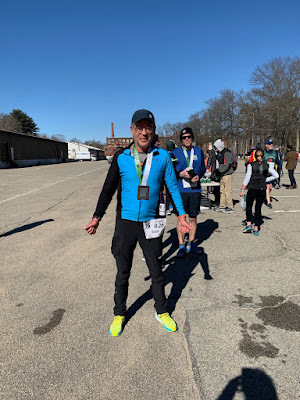 Update: I ran my first race in the Carbon Rocket, the Old Fashioned 10 Mile in Foxboro, MA. I once (1970's) won a marathon there and forgot how hilly the back roads are there! It was my first road race of 2019 with the temperatures a pleasant if chilly mid to upper 20's, -3 C. My race was decent but not great, 7:49 pace, 4th in AG. As far as the Carbon Rocket I had no issues with low drop: no calf soreness, no cramps, etc... I do miss a bit more drop and may add a piece of insole to the heel. They are very stable if the pavement is smooth, not quite as good on uneven pavement as the on the ground platform is quite narrow. But they are for sure more stable than Vaporfly especially due to the fantastic upper. I wore slightly heavier ON Running socks and never thought about the upper. The ride is firm but very well cushioned. My legs never tired right to end and when things flattened out I was easily able to pick up the pace without getting stumbly. If the race had continued to a half on flats I am sure I would have finished faster than I started. I found the stiffness not ideal on steeper climbs and descents. Interestingly my pace, cadence 182 and stride length 1.14 meters was almost exactly the same as in my last half run in VaporFly FK (which is firmer than the very original Ice Blue Vaporfly.) My heart rate average was also identical although I was 3 seconds per mile faster in that 2018 season ending half marathon. That race was in Atkinson and also hilly and with similar temperatures. I think both shoes are best run on flatter type courses for me or at least ones where the hills are more gradual than these last two races. I would consider Boston more gradual than yesterday's hilly portions of the course. The day after the 10 mile race zero soreness very reminiscent of the post race and next day leg condition of races run in Vaporfly. I have been a big Vaporfly fan for all distances. Here the toe off seems to rely on the mid foot and then the front rocker more than the curvature of the plate and softer foam as in VaporFly where there is more of a sense of falling forward to toe off. The feeling here is different. I do think the Vaporfly is likely easier on the legs. 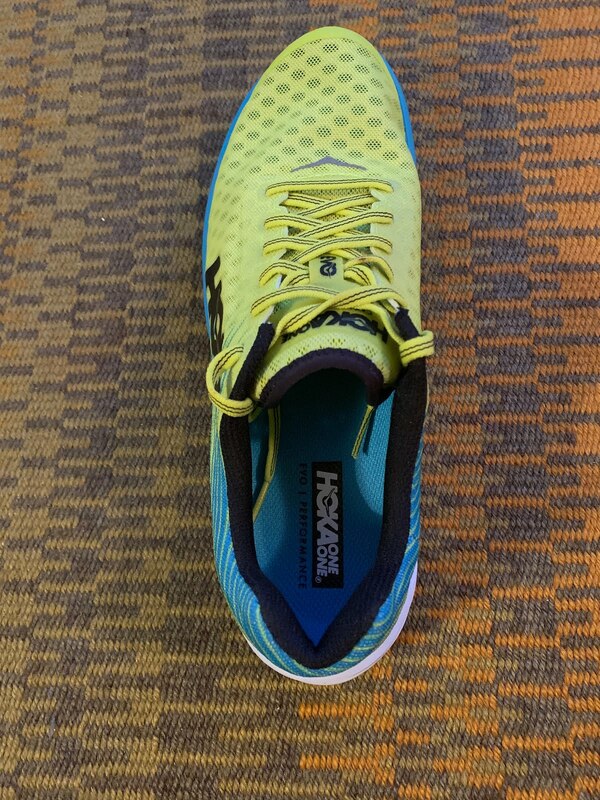 The Rocket also reminds me in many ways of a more dynamic Kinvara 10 (RTR review) also a stable shoe with very decent forefoot cushion but the K shoe just doesn't have the Rocket's distinct pop and response or for that matter its cushion at the forefoot. Compared to the lighter Skechers Razor 3 Hyper (RTR review) , the lower drop Rocket actually has more effective drop for me as its heel doesn't compress as much, particularly at slower paces. I worry about the soft heel (lack of outsole rubber thickness I believe the cause) of the Razor in later miles of a race when back on the heels. The Razor cushion is completely different in feel, lighter and springy but without the dynamic rebound of the Rocket's carbon plate and denser midsole. Uppers are similar in fit with Razor slightly roomier at the toe box. 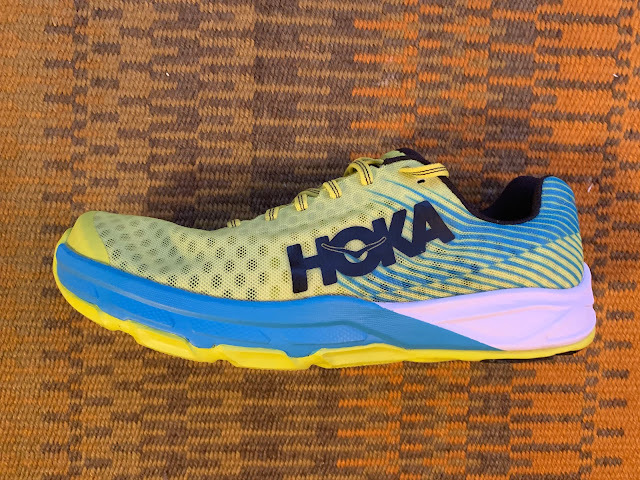 Compared to the Hoka Tracer the ride here is considerably more cushioned but also similarly on the firm side. The addition of the 8mm of rubberized foam to the outsole (vs more conventional rubber as the only outsole and 2mm more overall stack at the heel and 5mm more at the forefoot is clearly felt in the Rocket leading to a much more comfortable ride with less harshness and more energy return from the plate. I found my first run easier on the legs and less harsh than in the Adios 4 (RTR review) and Rocket easier to run faster and longer likely due to the superior forefoot cushion of the Rocket and the effect of the plate in the mix. Sam.Which would you choose for a marathon? Sketchers Razor3 or this Hoka Carbon Rocket? I'd love to use the Vapor Fly or the new version of the Zoom Fly but the knit just doesn't work for me. With decent conditions I'm looking at running 3:12-3:15. The only thing that has me hesitating on this shoe is the extra weight and lower drop. Thanks! We will keep at it! Thanks for reading Road Trail Run! See our page with links 100’s of in depth shoe and gear reviews HERE. You can also follow RoadTrailRun on Facebook, Twitter, YouTube and Instagram where we publish interesting run related content more frequently as well as links to our latest reviews. Shopping through links on articles help support RoadTrail Run and is much appreciated! Are these wider than the 4% Flyknit's? In the arch area I found that my foot would hang over the side and chafe like crazy giving me blisters. Have not had that issue with either original VF or FK but could see how it could happen with a wide mid foot, and more so potentially with original. Which version do you have? Also do you typically run in pronation control shoes and did you size up in VF, not a good idea IMO. Looking at both sole to sole their mid foot width is about the same but the Rocket does not have as sculpted out sidewalls on the medial side , so more vertical side walls there so I think less chance of spilling over. This said it is not a wide fit shoe, it's a very comfortable race fit shoe. Thanks for the quick response Sam. I have the Flyknit version. I got my true to size 10.5 and length wise they are alright. I run in neutral shoes and currently have the Beacons and Turbos as my daily shoes. Have the Torrent for the trails and ran a 50k recently in them with no issues in the area causing issues in the 4%. Sam. to answer your question, I race in the Zoom Fly version 1. I tried both the Vapor Fly version 2 and Zoom Fly version 2 but they didn't work for me as my foot would move around too much on landing. I'm looking for something light and fast. It seems the Razor 3 would be ideal if it had that carbon plate.Not only would it give an extra pop but the plate in the Zoom Fly works well for a bunion I have. It transfers the stress across the entire front foot rather than just on that big toe. Believe it or not, it simulates what special inserts costing hundreds of dollars are designed to do. So unless they make an upper like version 1 for the Vapor Fly or the new Zoom Fly I'm going to have to settle. I buy dozens of shoes looking for the ones that work best for me. Lately, I find myself reaching for the Sketchers Go Run Ride 7. If they tightened up the heel a bit and shaved off a little stack height and added a carbon plate it would be perfect for racing a marathon. As it stands it's my favorite shoe for training runs from 10- 20 miles. I read this blog constantly and have introduced it to many of my running friends. I just wish companies Like Nike would understand that not every upper work for every runner. It's a shame they don't reach out to the middle of the pack guys like me to find out what we need.Like you I'm an older runner. I'll be 60 this summer.We still want to be as fast as possible. But what works for an elite does not always translate to us. Thanks for all your great work and that of your Blog members. 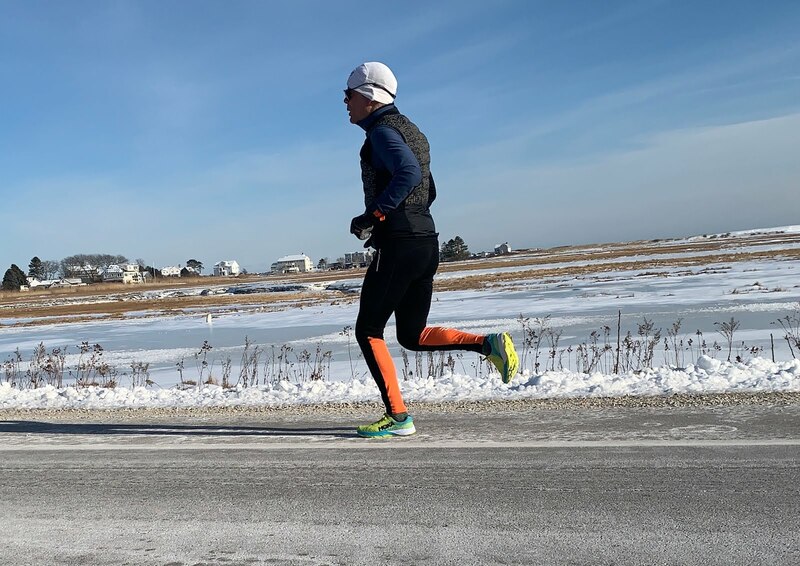 Maybe I'll see you on the road as I do my long runs on the coast a lot from our beach house in Seabrook up to Rye Harbor and back. We will have to run sometime. Tomorrow my plan is to head South from my place on Cable Road running to Hampton Beach for 15 I hope. Training for Boston? I am giving it another go having got a 3:40 BQ at The Cheap Marathon down the street from you. I am 61 so soon you will be in my AG! While I tolerate the I am not a big fan of "stretch knit" uppers. I think brands think the stretch will make the shoe fit more feet and wider feet but in the end I think they compromise to much. It seems the trend this year is away from them towards very thin non stretch mesh with a mono filament type fiber, so similar to Razor 3, Kinvara 10 and Skechers Speed Elite Hyper. That last when it comes out might be a good option as it has a carbon fiber plate. Last Reagan. Going to do my long run in Carbon Rocket tomorrow and will update article with results. The only thing that concerns me a bit is the 1mm drop but we will see. Thank you for this Sam. Very interesting. I am a fan of the Tracer 2. For me the Tracer 2 strikes the right balance between being cushioned but not too soft, as well as being nice and stable. I will be interested to hear from anyone who has run in both the Tracer 2 and the Carbon Rocket and can compare them. Which scenarios will the EVO Rehi be the better option? Seems like the Carbon Rocket is the one most of the elites are using for both speed work and racing. I would say Rehi for 5K to say 10K but lean towards 5K for most and for those who like a flexible lighter race flat as Rehi is the only really flexible Hoka. I got to get me those shoes! Should be great for my hill sprint sessions! Thanks Sam! Which of the two would have an overall more accommodating fit? I was sized half a size down from normal in Rehi (what they had and based on what Hoka was seeing) and fit was fine if really race fitted. True in the Rocket and other than a bit of pressure on pinky toe, so narrow up front fit is overall accommodating and correct for a race type shoe. Upper is super simple single layer of non stretch mesh with a thin lining with round holes. How did the long run go today? Did you use the Rocket? Just fine 13.1 progression ending at 8:54 pace, lower 8's the last miles. Not trashed despite their being firm from the plate.. Drop was no issue but as I knew the stat was a bit more conscious of it occasionally but never felt back on the heels.Article was updated, see above. And your long run? Sam how does the fit compare to that of the Kinvara 10? Thank you for the quick reply! that is exactly what I was hoping for sir! Thanks again for the quick reply, and the great reviews! See it could happen but so far hasn't and my runs on pavement did have some road debris which could have gotten stuck in the windows. My pleasure! Thanks for kind words! RTR team will keep at it. In regard to rocks getting caught in the open spaces on the bottom. I wonder if a little shoe goo might solve that problem. Do you have any initial thoughts on how this compares to Sketchers SpeedElite? I wonder how does this compare with traditional race flat like NB 1400v6 or adidas Adios 4. The best shoes I have ever had is the Tracer 1. I think it was much better than Tracer 2 for several reasons. I run 5-10km and appreciate lightweight shoes that gives you a natural run feeling and are not too bulky (but ok cushioned). Do you think that the Carbon Rocket can be my Tracer 1 replacement? Which other shoes would you recommend? Looking forward to your response. I am dying to find a replacement for my old Tracer 1 shoes! Compared to Speed Elite need to test more closely but Speed Elite's plate is up front and in the form of an H so a different approach. My sense is the Speed Elite is a shorter distance shoe than Carbon Rocket for most. The Carbon Rocket has a flatter feeling effect from the plate more concentrated in its energy return at mid foot. More to come on comparisons but I do compare to Adios 4 in article. The Carbon Rocket is clearly more cushioned, if firmly so than 1400v6. I found Tracer 1 very firm and stiff and like you good for about 5-10K max. The Carbon Rocket is firm but considerably more cushioned than Tracer. It of course will be stiffer relying on the plate dynamics for push off. As far as other shoes while yet less cushioned but softer so than Tracer look at the new Hoka Rehi. It is the most "natural" race flat from Hoka and is quite flexible unlike Tracer. Also you might consider the ON Cloud X, NB 1400v6, Hoka Mach 2, NB Beacon, or potentially Zante Pursuit which may be closest to Tracer of the bunch. See reviews linked below. I have been running in the Pegasus Turbo and while it is cushioned, I am not loving the squishy / deformed feeling. How does the cushion / firmness of the Mach 2 compare to the Razor 3 Hyper? Do you consider one superior to the other? Yes Turbo is as you describe as there is no carbon or other plate in the mix with the soft but rebounding Zoom X foam to stabilize it. Mach 2 is somewhat firmer than Turbo and more cushioned than Razor 3 with a bouncy ride vs. a springy zingy ride for the Razor 3. If you are not a regular forefoot mid foot striker then Razor really should be reserved for faster days and races, as intended. What are your training and racing paces? Mach is more a trainer in feel and utility but it can race as well. It's midsole and ride is not as distinctive in feel as either Turbo or Razor. I just finished my first run in the EVO Carbon Rocket, so you can use that shoe as a comparison standard between the Mach 2 and Razor 3. I think I'm a pretty decent mid foot striker, but my easy day paces are ~8:00/mile. My 5k race time is 18:36, 10k 41:32, Half 1:33:00. In order of firmness (softest to hardest) does it go Turbo, Mach 2, Razor 3, Carbon? I am seeing great reviews of the Razor 3, and pretty positive reviews of the Mach 2. I had instep trouble with the Clayton and Mach 1, and as such I am leery. I am not sure I need both shoes so I am trying to decide which to get. How did that first run go in Carbon Rocket? As before firmness depends on pace. In terms of firmness yes Turbo softest overall but thin feeling up front, Mach fairly soft but balanced feel heel and forefoot, then Carbon firm but best cushioned of all, then Razor 3 for its heel which while soft becomes firm as it tends to bottom out with its forefoot very well cushioned. Overall if training plus racing the two Hokas are the most balanced in softness and cushion, the Turbo softest and good for slow training for me, and Razor only for faster running. So you have context I run my halves these days between 1:35 to 1:39 on a good day, my race shoe recently for those Vaporfly, for 5K Reebok Fast Pro, for 10K to half Vaporfly but next I will try would be first Carbon, then Razor. I raced one half in Mach 1 and it was OK but stiff. As far as instep trouble Clayton 1 gave me issues on first run for a few miles, Clayton 2 very little, Mach none but people all have different foot shapes. I think flatter wider mid foot feet have the most trouble in Clayton. I really enjoyed the Carbon Rocket. I was doing a workout (WU, Tempo, Repeats, CD) and it felt very responsive and fast. So you are saying the Razor 3 is firmer than the Carbon? I am a lighter runner (~145 lbs) with fairly fast cadence. Do you think I would experience the bottoming out on the Razor? Or do you suggest I get and try both and return what I don't like? Would you recommend HOKA Rocket or Clifton 1 for running a 3:37ish marathon? I have the Clifton 1s and like them but wondering if it would be better to race in the Rockets. also, currently have PF which the Cliftons help support. Razor 3 for me ends up having a firmer and lower feeling heel than Rocket as I heel strike and there is not much rubber at the heel so I sense bottoming out. I weigh 165 so for you if you can keep the tempo up and off the heel may not be an issue. I would struggle more later in a marathon in Razor I think than Rocket despite its 1mm drop. This said overall Rocket is firmer feeling than Razor but at the same time more cushioned as it has greater stack (26/25 vs. 23/19 for Razor) despite the wonderful characteristics of Hyper Burst foam, springy and zingy. I suppose you could also throw the Beacon in the firmness comparison scale as well, since I have and like the Beacon. Very different rides between the Rocket and Clifton 1. The Clifton 1 is softer and bouncier and for me very unstable at the heel. (wouldn't be surprised if they contributed to your PF quite frankly). Rocket is firmer, much more stable but well cushioned and instead of bounce feel has a snappy response. If Clifton works for you and at your marathon target and if you have successfully run a marathon in them I might lean towards Clifton, first trying Rocket for shorter races to see how it goes. I know the Altra Duo doesn’t have a plate, but from a weight, stack, and drop perspective the Rocket and Duo aren’t far apart. The Duo is my go to right now and I find them to be extremely versatile for anything from speed work up to very long long runs, and even some trails. The Duo midsole has pop and protection and for me feels very efficient. Just interested to hear your thoughts - this is first Hoka I’ve been tempted on in a couple of years. Like others, I really liked the Tracer 1, but I have always wished that shoe had a little more energy return for the amount of firmness it had. Duo is great! Have to refresh my memory with a run in them soon to compare but yes quite a few similarities including drop. The Duo is more flexible and has about 5mm more stack all around so clearly more cushioned than Rocket where the plate is also in the mix. I will say right away that Rocket is more decisive in its rebound and I believe somewhat firmer, due to the plate and less the midsole. I could barely tolerate the Tracer 1, its stiff firmness didn't give me much back while the Rocket while on the firm side gives back in spades in a flat consistent stable fashion. Of course as noted above in the comparisons the Rocket has more stack 5mm more in the forefoot and 2mm more in the heel than Tracer. I don't mind firm shoes at all but not ones which don't give back. For example the Reebok Fast Pro has a super low stack but for short races are my go to as the combination of the Pebax midsole and the outsole give back big time while of course being firm and thin. Thanks Sam - phenomal feedback!! Any thoughts how this might compare to the non-Pro Floatride Run Fasts for something like a half? I love the Fast and its yet lighter weight but all around due to the Carbon plate and more cushioned forefoot I personally would lean towards the Carbon for a half. Thanks so much for kind words! The team will keep at it! Obviously lighter weight shoes generally are faster shoes but given your weight (how tall?) not every light weight shoe will be ideal. Did you find the Zoom Fly thin in the forefoot? The Freedom not cushy ioned enough? One of our key testers Jeff Beck I think is about your weight and race pace, a bit faster. He likes the NB 1080v8 (great all around trainer) a lot and has just tested the Ultra Boost 19 (heavier protective but fast for him shoe). You might for your faster running also look at the Nike Zoom Vomero 14 or Brooks Launch or Saucony Kinvara 10 ( the lightest of the bunch) but with decent support and good cushion. Thanks for the reply Sam!! Wish you the best!! !The zoom fly it was a bit unstable while cornering and caused blisters on my achilles tendon if i didn't wear thick shocks but it was a super cushioned shoe fast and with springy feel.Saucony freedom iso is a fast and light shoe with great cushion but lacks of responsiness!! How did sizing work for you in the shoe? When I put my size into the True Fit guide on Hoka's website, it tells me to get a 13 (I usually wear 12.5s), but when I asked a Hoka representative on Instagram, they said 12s. Covered in the review as follows: "My first run was in medium thickness Stance socks and fit was true to size if a bit short and snug, particularly in the area of the little toe bunion so this is a quite narrow front of toe box. My second run was with "appropriate" thin Compressport Race socks and more comfortable with no bunion pressure. No question this is a race fit type upper and stuffing thick socks into them at true to size is not the way to go.". This said one of other testers for our full review went true to size and might have sized down. What other shoe models and sizes that work can you share so as to maybe get closer. Hope you will consider purchasing a Running Warehouse via the links above. Purchases help support our work. Thanks! They have very reasonable return policies and fast shipping. Hi, thanks for the great review. Will the Hoka One One EVO Carbon Rocket or the Zoom Fly FK work with orthotics? What do you think the durability will be compared to the Kinvara? Purchased a pair (using the RTR19 discount on RW, of course) of these on your initial praises for the shoe and I have not been disappointed! I haven't ran a true tempo in them yet, but I have a 4 mile at HMP with 4x200m after planned for this Saturday. Based on my initial runs I think these are going to be a workhorse for me. I am hoping the shoe gains a touch more flex after some mileage. The upper is executed perfectly, though, at least for my tastes. Like I said, I wear 12.5s in everything else from Asics to Hoka. That's good to know that RW has a great return policy. Hi Caleb, Thanks for reading and purchasing with our link and discount code. Glad you are enjoying them. Workhorse as you say for long fast miles a good way to describe! hey will get a touch more flex far back where the foam color changes. I think it is a polarizing shoe as the feel is different than many shoes and Vaporfly. Flat, stiff and stable might be a way to describe it with lots of forefoot cushion of the stable firmer variety as well. how is the shell at the heel? as soft as Mach or as rigid as the Tracer2 ,? Don't have my Tracer to compare but Rocket unlike Mach has rigid heel counter. Very stable heel although on the ground platform is narrower than other Hoka such as Mach.